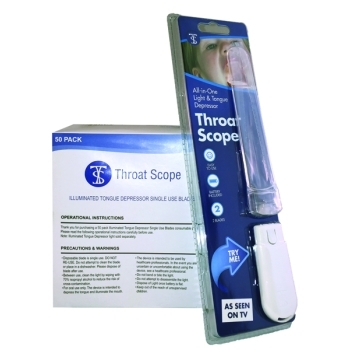 Introducing Throat Scope Illuminated Tongue Depressor, the all-in-one light and tongue depressor. Are you a medical professional who struggles with children who refuse to open their mouth for an oral cavity examination? Would you like the oral cavity examination process to be easier for you and more exciting for your patients? That’s where Throat Scope comes in. Throat Scope has been designed to take the stress out of oral cavity examination by providing a fast and accurate diagnosis, replacing the traditional and ineffective wooden tongue depressor with an innovative solution that will deliver the best results for medical professionals while seeing patients. It is fast becoming the tongue depressor of choice across the industry, and you will see it in most chemists around the country. 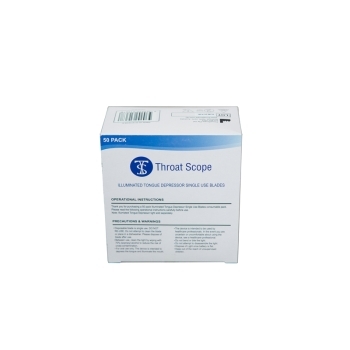 Our dedication to providing only the best products to our customers is why we proudly stock Throat Scope. 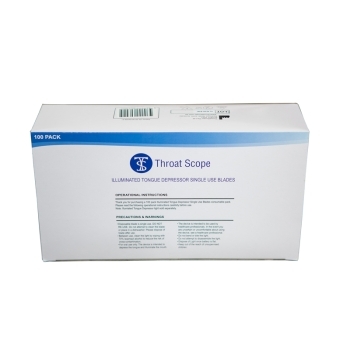 We have the Throat Scope starter pack in stock, as well as packs of 50 and 100 blades as well. Aside from Throat Scope products, we also carry a range of other medical supplies at the best prices you’ll find in Australia. This, combined with our excellent customer service, is what has helped us gain our reputation for being the suppliers of choice in the medical industry and what keeps our customers coming back time and time again. Browse through our extensive range of other products today! For more information or to make an enquiry, please don’t hesitate to contact us today!